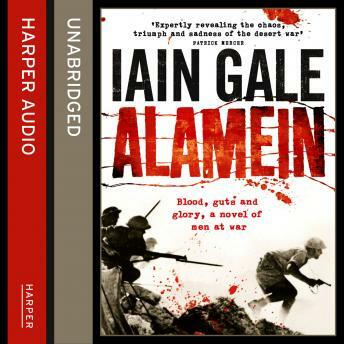 The start of a new series from Iain Gale, author of Four Days in June, Alamein, and the Jakc Steel series. There are some battles that change the course of history: Alamein is one of those. In October 1942, Britain and its allies were in real difficulties: Germany and its Axis partners seemed to be triumphant everywhere - in Europe, in Russia, in the Atlantic and were now poised to take the Suez Canal. It was in North Africa that the stand was made, that the tide of World War Two began to turn. It was a battle of strong characters: the famous battle commander Rommel and the relatively untested new British commander, Montgomery, leading men who fought through an extraordinary eleven day battle, in an unforgiving terrain, amid the swirling sandstorms and the desert winds. Iain Gale, author of the outstanding historical novel Four Days in June on the battle of Waterloo, tells the dramatic story through seven characters, almost all based on real people. Drawn from both sides of the conflict, they include a major from a Scottish brigade, the young lieutenant in the thick of the tank battle, the Australian sergeant with the infantry, the tank commander of the Panzer Division and the charismatic Italian commander of a parachute battalion. Through them and others we see the flow of battle, the strategies, the individual actions and skirmishes, the fear, the determination, the extraordinary courage on both sides.